flows directly from a natural source and is gentle on skin. It is treasured as a hot spring that beautifies skin. by the majestic Yufu mountain range. Bathing Time…7:00 a.m.ー10:00 a.m.／3:00 p.m.ー 10:00p.m. 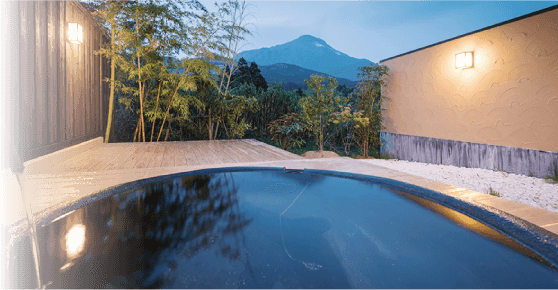 The reserved open-air baths in a variety of styles soothe both mind and body. You can enjoy the baths while taking in the majestic view of Mt. Yufu. Spend a peaceful time as you take in the changing beauty of the natural scenery in the morning and evening hours. 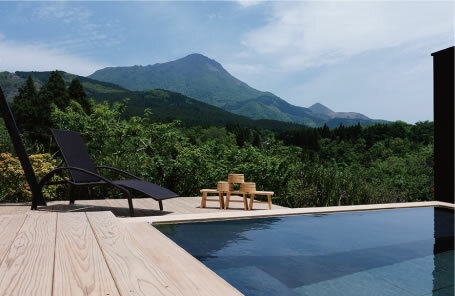 You can spend a relaxing and luxurious time taking in the seasonal natural landscape of fresh greenery and majestic Mt. Yufu spreading out before you. There are two different styles of reserved family baths available. 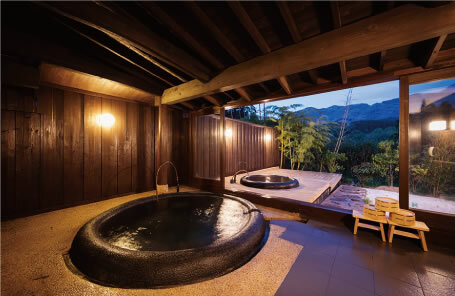 With a different view from the bath in your room, experience the charms of the hot spring anew in a relaxed atmosphere that exudes the warmth of natural wood.